There have been many complaints in the Google Web Search Help forums that Google has removed the ability to "search within results." 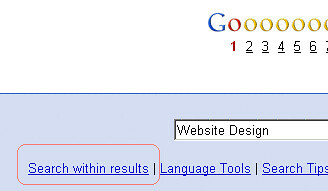 As you may have noticed, the Search within results link no longer appears at the bottom of your search results page. Right now you might be thinking, 'What? No way! How am I going to narrow down my results now that it's gone?' Well have no fear - I've got a little secret for you: when you used to click on the Search within results link and type in additional search terms, you weren't actually searching within your previous list of results. In reality, your new search terms were simply added on to your original entry and then another search was performed. We've eliminated that extra step you used to take to modify your results. Not everyone is happy with this but I doubt Google will change it.